The Tanoshiboy Chronicles: Design & Illustration Blog: ARRGGHHH...I"M DROPPIN' LOADS! Moshi-moshi! 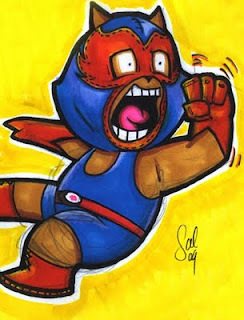 Weeks ago I created Sushi & Gazpacho, a luchador tag team. Sushi (a cat) hailed from the land of the rising sun and unlocked the explosive power of Sushi onto his foes. Well, I decided to play around with the design a little bit. It's getting closer to what I want...it's kind of going the route of Octo-puss, where I play with it and play with it until I'm happy. Such is life. Sayonara!